To crop a photo means to trim away some of its perimeter. The Trim tool on your Nikon D7200 enables you to crop right in the camera. Cropping can often improve an image, as illustrated by the following figure. Cropping creates a better composition and eliminates background clutter. When shooting this scene, the photographer couldn’t get close enough to fill the frame with the ducks, as shown on the left. So he cropped the image after the fact to achieve the composition on the right. Always make using the Trim tool your last editing step because you can’t alter the cropped version using any other Retouch menu tools. After you select Trim from the Retouch menu, you see the screen shown here. The yellow box indicates the ­cropping frame. Set the crop aspect ratio: You can crop to one of five aspect ratios: 3:2, 4:3, 5:4, 1:1, and 16:9. The current aspect ratio appears in the upper-right corner of the screen. To cycle through the other settings, rotate the Main command dial. Adjust the crop frame size: For each aspect ratio, you can choose from a variety of crop sizes, which depend on the size of the original. Sizes are stated in pixels, with the current size displayed in the upper-left corner of the screen. If you’re cropping in advance of printing the image, remember to aim for at least 200 pixels per linear inch of the print — 800 x 1200 pixels for a 4 x 6 print, for example. Shrink the cropping frame. Press and release the Zoom Out button. Each press further reduces the crop size. Enlarge the cropping frame. 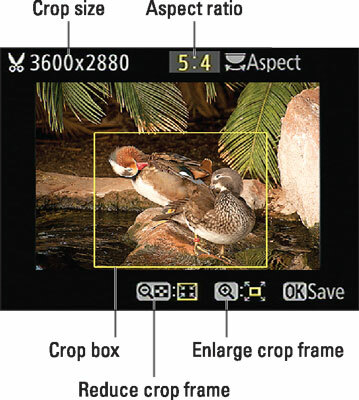 Press the Zoom In button as many times as needed to get the frame size you want. Reposition the cropping frame. Press the Multi Selector up, down, right, or left. When you view cropped images in Playback mode, a scissors symbol appears in the lower-right corner of the frame.